Although it ended in 2005, Everybody Loves Raymond continues to enjoy a happy life in syndication in the U.S. and overseas. That last part was recorded in the documentary film Exporting Raymond (Blu-ray $35.99, DVD $30.99; Sony Pictures Home Entertainment; released on Aug. 2, 2011). 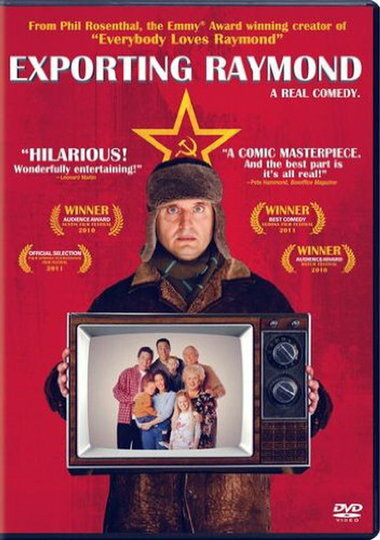 The lively, comedic documentary follows Phil Rosenthal, the creator of the smash TV sitcom, as he travels halfway around the world to Russia to observe and assist in the adaptation of Raymond to Russian television (where it’s renamed Everybody Loves Kostya). Disc Dish spoke to Rosenthal, who informed us that the spark that ignited the making of Exporting Raymond and the film’s subsequent release in movie theaters last spring is nearly as funny as the movie itself. Disc Dish: How did you have to sell the idea of making this movie to Sony? 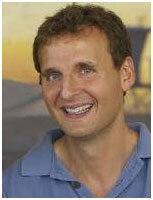 Phil Rosenthal: I didn’t have to sell it to anyone! I actually had no intention of making it. I was called into the Sony offices. 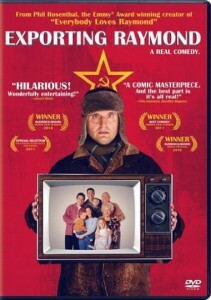 and they told me that Sony had created the sitcom in Russia. They had done it years earlier with The Nanny — it’s called Niania over there — and it became a big hit. Apparently, the people on the show over there were a really interesting bunch who had come from all kinds of different backgrounds. So they asked me if I’d like to go to Russia and observe how we work with the creators over there, and then come back to America and write a fictional feature film about a TV creator of a show who goes over to Russia to have his show translated. DD: Sounds like a great idea. DD: Wow, it happened that quickly? PR: It was that quick. But then, of course, it took six years to get going. DD: The low budget considerations must have sounded appealing to the Sony people. PR: The way they carried on, it was as if I was making Avatar. And it only cost $1.5 million. And when I first came up with that number, they came back to me and said, ‘Do it for $900,000.’ Right away, they have to set a number so ridiculously low that it can’t be made. That’s show business. I could do a whole other documentary about the release of this documentary. DD: Getting a smaller film into theaters can’t be an easy feat these days. PR: It’s nearly impossible, particularly a film like this. But you want to get it out there so it can at least get a little press to carry over to the DVD release and then get awards consideration. But nothing’s in the theater for long; they have to move it out and make room for the next toy they’re selling. They told me to not even bother writing a film unless I’m selling a toy. DD: They really said that? PR: Yes they did. It’s very sad. DD: It’s like all those jibes and sketches about Hollywood, but it’s like they’re not jokes anymore. DD: And he wasn’t joking? PR: No, that was no joke. Why? Am I laughing?